Lockheed Martin (NYSE: LMT) has secured two separate contract modifications from the U.S. Air Force to build C-130J Super Hercules aircraft. The Defense Department said Wednesday Lockheed will produce 32 C-130J military transport planes in various configurations under a potential five-year, $1.1 billion contract. The definitization contract modification is part of a potential $5.3 billion multiyear II contract that covers the production of 30 MC-130J, 29 C-130J-30 and 13 HC-130J for the Air Force and six KC-130J for the U.S. Marine Corps, Lockheed said Thursday. Work under this contract will occur in Marietta, Georgia, through April 30, 2020, according to DoD. Lockheed will also build 11 C-130J planes in different configurations under a separate contract modification worth approximately $62 million, DoD reported. James Drew also reports on Flight Global that Congress will use defense budgets for fiscal 2013 and 2014 to fund this contract, which includes three HC-130J, three KC-130J, two MC-130J, one C-130J-30 and two U.S. Coast Guard HC-130J. The contractor is scheduled to complete work on this contract through Jan. 31, 2018. 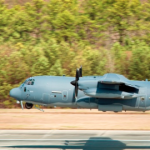 Lockheed and its partners also received a $545 million contract from the U.K. defense ministry to provide operational support for that country’s fleet of C-130J. The premier source of breaking business news for the government contracting industry, GovCon Wire provides informative, to-the-point stories of the most significant contract awards, top-level executive moves, M&A activities and financial results of the sector’s most notable players. GovCon Wire is always on top of the most recent contracting sector activity and is updated in real time as the news breaks.